When Bram Stoker penned “Dracula,” arguably the Irish author’s most recognizable piece of writing, little did he know how much the blood-hungry protagonist would become embedded in pop culture years later. Today Dracula is easily one of the most recognizable characters in literary history, not to mention a staple at Halloween costume parties around the world. Growing up in Dublin, Ireland, Stoker took much of his inspiration for his horror novel, which was released in 1897, from his hometown and points nearby. 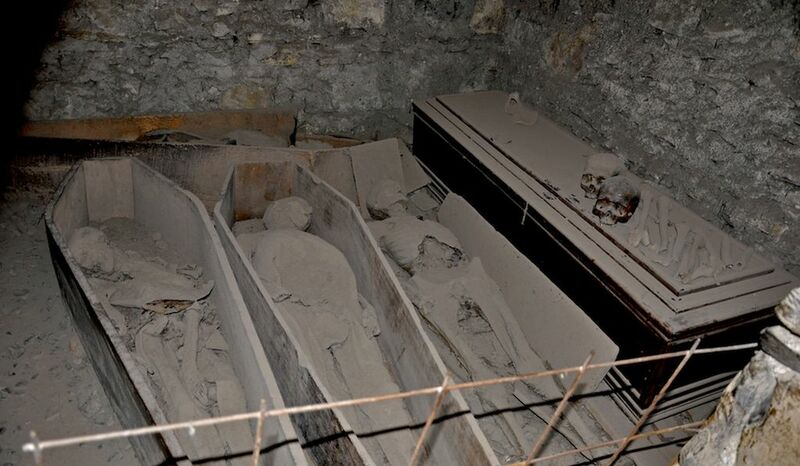 From the crypts tunneling beneath a medieval church in the center of Dublin to the crumbling façade of a former monastery in a seaside town where he would go on holiday, inspiration was all around him. And there’s no better way to experience the man behind the book in person than to follow in his footsteps. In addition to being a wealth of inspiration for the author, the city is also the location of the annual Bram Stoker Festival. Now in its seventh year, the four-day event (October 26-29) celebrates all things Stoker and will include a “gothically inspired program of events” such as live performances, readings and guided tours. While many of his haunts will serve as venues during the festival, the following places are a must visit for any “Dracula” fan. The small, Georgian-style house located at 15 Marino Crescent, Clontarf, Dublin 3, is everything one would expect from the birthplace of the literary legend. In an article published in “The Irish Times,” the author describes Stoker’s childhood home as an old house that “creaks and groans at night” with crucifixes displayed prominently on the walls and black wooden beams crossing the ceiling. Stoker lived there until adulthood, eventually moving into a house at 30 Kildare Street, Dublin, 2, an historically landmarked building. While both properties are not open to the public, they’re still both worth visiting just to be able to walk in the author’s footsteps. During his college years, Stoker was better known for his athletic prowess than his academic abilities, competing in weight lifting and speed walking competitions. 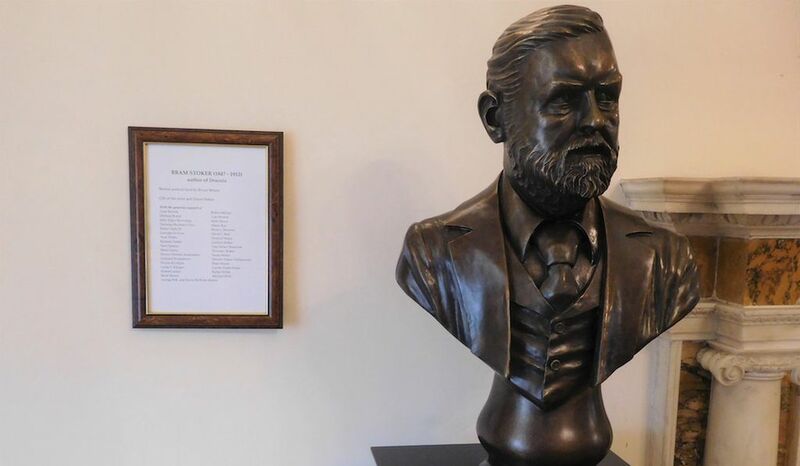 Between studying and events, he also worked as a civil servant at Dublin Castle and juggled roles as auditor of the school’s historical society and president of the school’s philosophical society, making him a well-known figure around the campus. In 1870 he graduated with a bachelor’s degree in mathematics, claiming that he graduated with honors, however Trinity College refutes that claim. Built in the early 18th century, Saint Ann’s has been an important landmark in Dublin for centuries and is notable for both its Baroque style of architecture and its many contributions to the community (since 1723, the church has had a bread shelf near the altar that offers freshly baked bread for anyone in need). The church is also where Stoker and Florence Balcombe were married in 1878. Interestingly, before tying the knot, Balcombe was dating another local legend: Oscar Wilde. 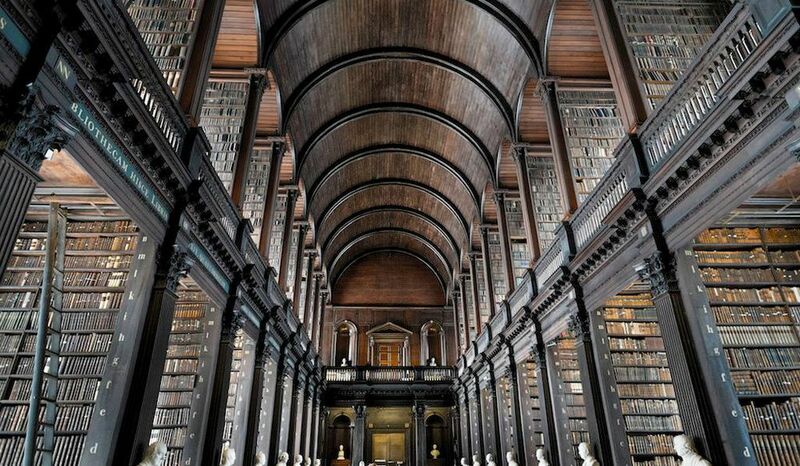 Much like Stoker, many of the world’s most celebrated writers have lived in Dublin, including James Joyce, Oscar Wilde, Jonathan Swift and Brinsley Butler Sheridan. 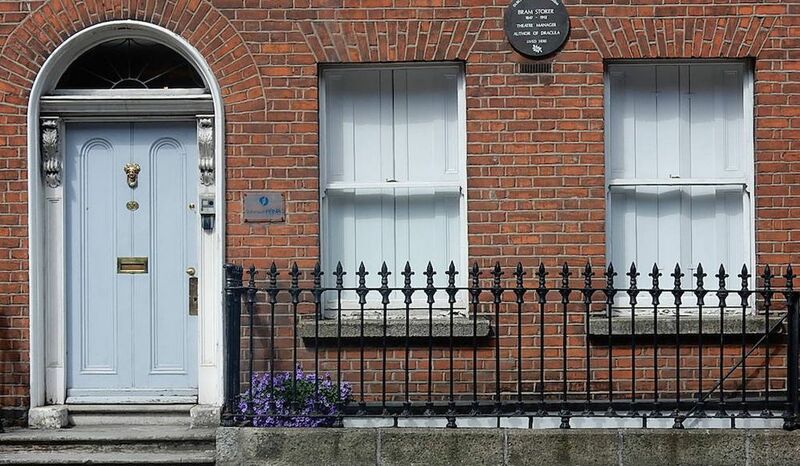 Perhaps one of the best places in the city to experience their literary accomplishments firsthand is at the Dublin Writers Museum. Housed inside an 18th century mansion, the museum contains a comprehensive collection of books, portraits and artifacts belonging to these late writers, including a first edition of Stoker’s “Dracula.” Other holdings include business letters penned by Stoker, a portrait by painter Aidan Hickey and a bust created by sculptor Bryan Moore given to the museum earlier this year in the presence of several members of the Stoker family. 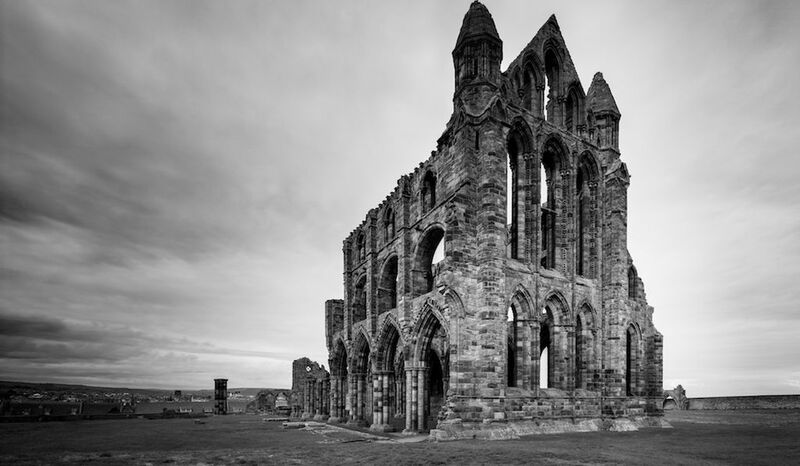 Although not in Dublin (it’s located 300 miles to the east in England), Whitby played a key role as inspiration in the creation of “Dracula.” In 1890, Stoker went on holiday to the seaside town, spending time exploring its medieval architecture, including Whitby Abbey, a crumbling Benedictine monastery founded in the 11th century. Stoker mentioned the abbey in his book along with Swales, one of Dracula’s victims, which Stoker took from an inscription on the headstone from a nearby graveyard. But perhaps the author’s biggest epiphany was during a visit to the local library, where he flipped through a book about Vlad Tepes, a 15th century prince who killed his enemies by driving a wooden stake into their hearts, thus earning the nickname Vlad the Impaler—or simply, Dracula. In the long line of pharaohs of the dynasties of ancient Egypt, Akhenaten was unique. Yet until recently, almost nothing was known about him. 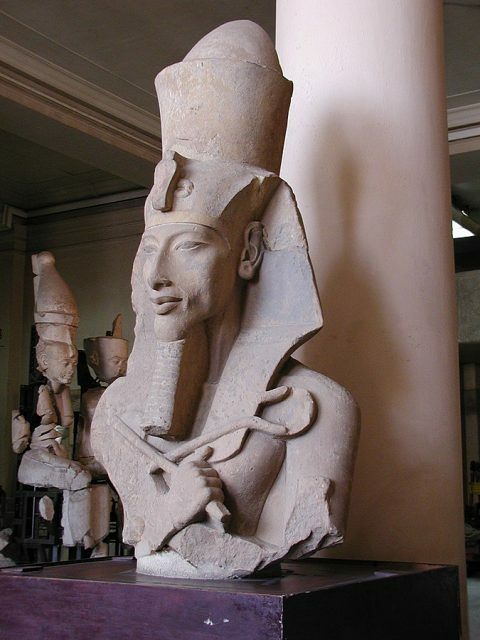 Akhenaten lived during the 14th century BC and his reign lasted for 17 years.. Evidence of his existence was discovered only in the late 19th century. The future king of Egypt was originally named Amenhotep IV, son of pharaoh Amenhotep III and Queen Tiye. He was not first in line to the throne but his older brother died at a young age. Some scholars believe that the young prince was shunned as a child, as he never appeared in family portraits. He later married the well-known Queen Nefertiti. Once on the throne, Akhenaten made revolutionary changes to Egyptian life. He banished worship of Egypt’s many gods, including Amun-Ra, popular among the priestly class. 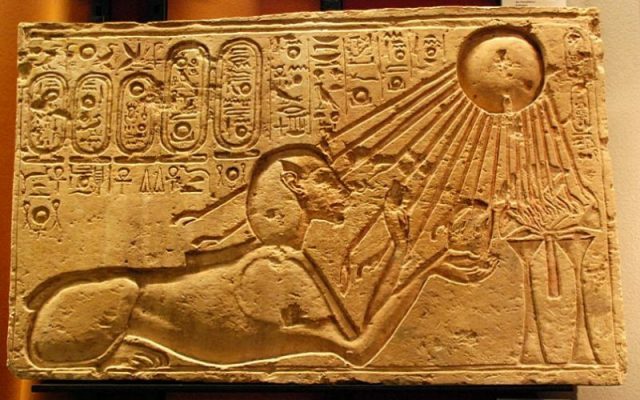 Instead, only one deity, the sun disk god Aten, was to be recognized as the Supreme Being. 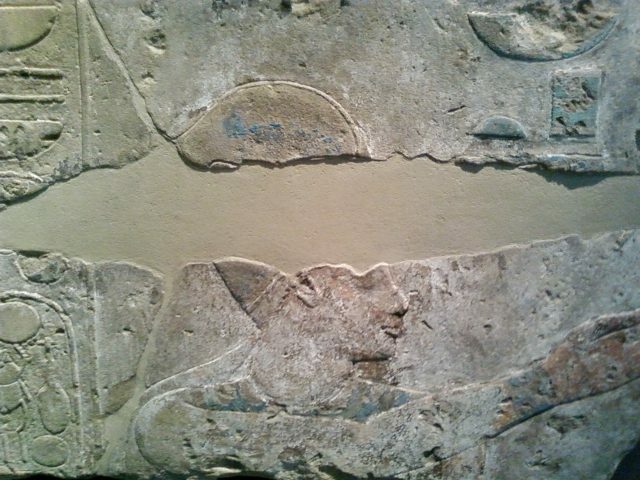 Akhenaten considered himself a direct descendant of Aten. Worship of Aten may have been the first known movement away from polytheism toward monotheism. Psychoanalyst Sigmund Freud once suggested that Moses may have been a priest to the cult of Aten, who later fled Egypt with his followers to maintain their beliefs after the death of Akhenaten. After changing his name to Akhenaten, the pharaoh ordered grand monuments built for Aten in the Egyptian capital, Thebes. 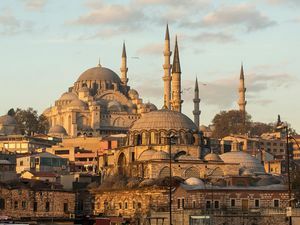 Temples were reoriented toward the east, where the sun rose each day. Icons for other Egyptian gods were removed. Akhenaten then had a new city built in honor of his god. Two years later, he moved the royal palace there. The new city was located at modern day Amarna and was filled with up to 10,000 people. The population included priests to the sun god, merchants, builders, and traders. Akhenaten lived here for ten years until his death. Along with statues, there were a number of sculptures portraying the royal family. This was common for the pharaohs of ancient Egypt. Almost all previous royal portraits depicted the king and queen as rigid. They are serious. They are wearing the royal insignia and their bodies are shaped perfectly and muscular. They look like gods themselves. Not Akhenaten though. His face looks stretched. The nose is narrow and the chin is pointy. He has large lips and broad hips. A pot belly oozes over his waist. Why does Akhenaten look so different from other sculptures of the period? One theory is that the king may have suffered some sort of ailment. One of the possibilities is that he had Marfan’s Syndrome, a genetic disorder that affects the body’s connective tissue. Some of the possible symptoms include a tall and thin body type, long arms, legs, and fingers, as well as curvature of the spine. Yet, Akhenaten and his family look like real people with physical flaws. It is timeless. The images reach out to us through the many centuries. 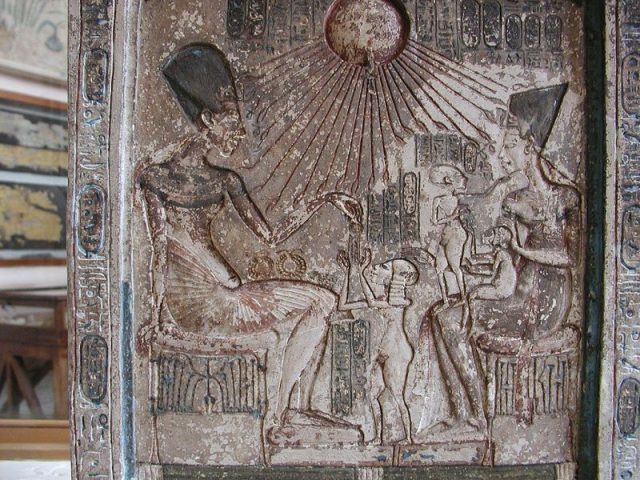 In one stone relief, the sun god Aten’s light is shining down on Akhenaten, Nefertiti, and some of their children. The pharaoh is holding one child in his arms, giving her a kiss. 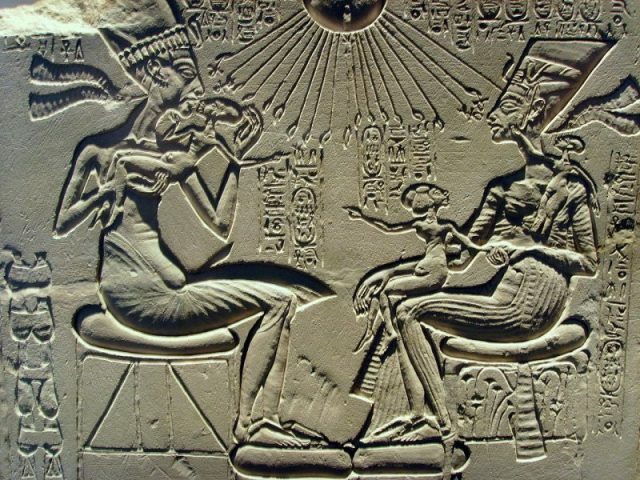 Nefertiti is holding two younger kids, one child reaching for the queen’s jewelry. It’s a scene that might look like any contemporary family. 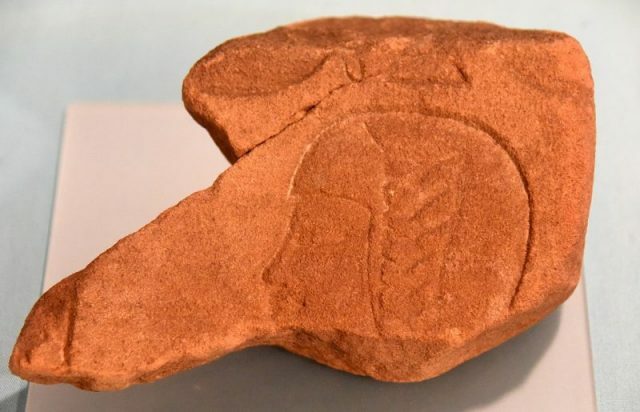 It appears Akhenaten’s rule was not popular, both within the kingdom and beyond. Correspondences from foreign rulers allied to Egypt describe frustration with Akhenaten’s lack of military and financial support. Egyptian power and influence declined during the king’s reign. Akhenaten’s religious reforms did not outlive him. Almost immediately after his death, the priestly elites of Amun-Ra and the other gods regained their influence. 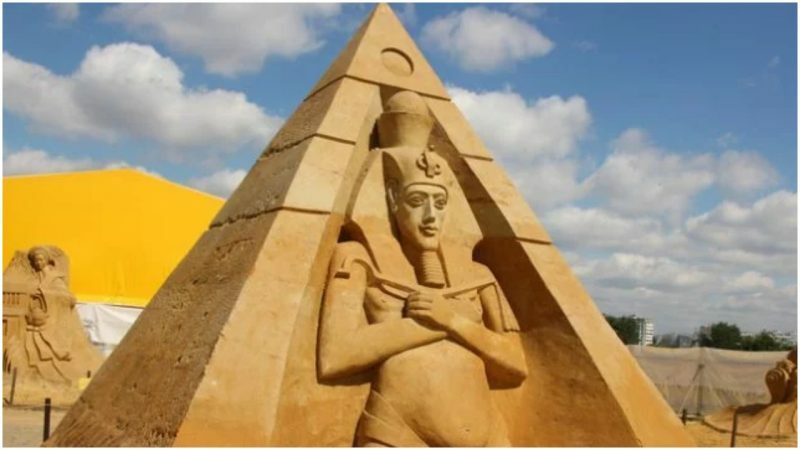 Statues and references to Akhenaten and Aten were removed. Akhenaten’s name was erased from official royal lists. His temples were destroyed and the material used for new building projects. The city at Amarna was abandoned — even the mummified body of Akhenaten was removed from his tomb, never to be seen again. 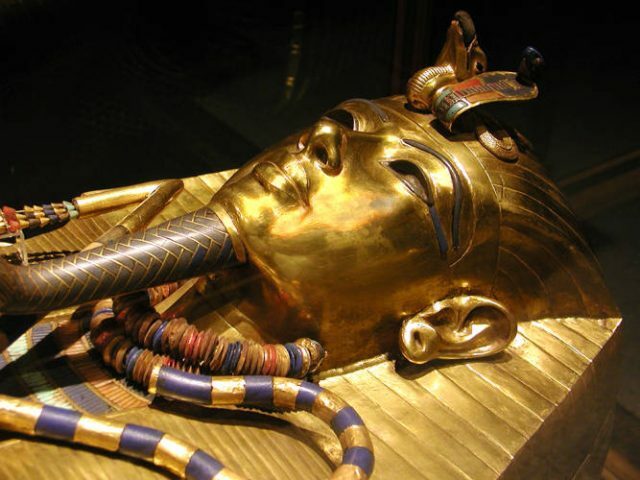 Akhenaten’s successor was one of his sons, King Tutankhamun, also known as King Tut. He is more famous today than his father because his tomb was discovered mostly intact by archaeologists in the early 20th century. As his name suggests, Tutankhamun embraced the old deity of Amun-Ra and the traditional ways of ancient Egypt. During his short reign, King Tut mostly turned away from his father’s legacy, the heretic pharaoh, Akhenaten. At the start of the 16th century the Opera del Duomo—the committee of officials in charge of the decoration and maintenance of the Florence cathedral—had a tricky unfinished project on its hands. A document from 1501 refers to a massive barely begun statue, “a certain man of marble, named David, badly blocked out and laid on its back in the courtyard.” The stone was a leftover from a long-running decorative project: in 1408 the committee had decided to decorate the roofline around the dome of the cathedral with massive statues of biblical prophets and mythological figures. The first two, put into place in the early 15th century, were a statue of Joshua sculpted in terra-cotta by Donatello and painted white to look like marble, and a statue of Hercules, sculpted by one of Donatello’s students, Agostino di Duccio. A statue of David, the Biblical hero who slayed the giant Goliath, had been ordered in 1464. This commission went to Agostino, and a huge slab of marble was extracted from the Carrara quarries in Tuscany, Italy, for the project. For unknown reasons Agostino abandoned the project after doing only a little work, mostly roughing out around the legs. Another sculptor, Antonio Rossellino, was hired to take over the project in 1476, but he backed out almost immediately, citing the poor quality of the marble. (Modern scientific analyses of the marble have confirmed that it is indeed of mediocre quality.) Left without a sculptor but too expensive to throw away, the massive slab sat out in the elements for a quarter century. In 1504, as Michelangelo finished his work, Florentine officials concluded that the statue was too heavy to place in its intended location on the roofline of the cathedral. A committee of artists, including Sandro Botticelli and Leonardo da Vinci, met and decided that the statue should be placed at the entrance to the Palazzo Vecchio in Florence. In 1873 it was moved indoors to the Galleria dell’Accademia in Florence and a replica was erected at the original site. 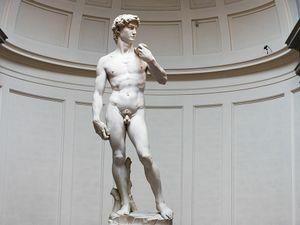 There are several aesthetic aspects of the David statue that may be connected with the tortuous process by which it was commissioned and created. The figure, although muscular, is slimmer than the bodybuilder-like physiques that are typical of Michelangelo’s other works. This may be because the marble slab was narrow, having been cut with the thinner statues of Donatello and Agostino’s era in mind. The absence of David’s traditional accoutrements, a sword and the severed head of Goliath, may be because there was no room to carve them in the block of marble or possibly because they would have been invisible once the statue was put in place on the cathedral roof. Likewise, David’s disproportionately large right hand and prominent facial expression may have been exaggerated to ensure that they would be legible to spectators on the ground.